Lots of investors are looking to get started, and as active real estate experts in Kansas City Kansas & Missouri, we get asked to share our secrets quite a bit. With the flood of foreclosure deals all but dried up (compared to where they were a few years back)… people are having to get more creative in finding the best deals on great local Kansas City investment properties, ESPECIALLY in Johnson County! That’s not how we work. We work with other investors to accomplish things together that we can’t do alone. We even share the source of our awesome website and believe me there are a lot of Investor Carrot Websites in the Kansas City Market. There are only a handful of brokers and investor wholesalers who conduct most of the business in the market. They’re used to working with the same people on a regular basis because who are you going to call first on the hot deal, the cash buyer who has closed 10 houses with you or the brand new investor who does not have a track record. It’s worth the time and effort to find them and learn from them. If you can, work with them. They’re your best source of good deals, now and in the future. How do you get to know them? Go to your local REIA, here in Kansas City that is going to be at MAREI and find the people who are active and talk to them. Ask them which real estate agents they use, what wholesalers in the area are active (and get their info) and let everyone you can find know that you are looking for investment properties that fit your criteria. And despite the time involved seek out all those investors websites and sign up as a buyer. Tell them exactly what cities you are looking for and what your strategy is so they can match you up with the hot deals. 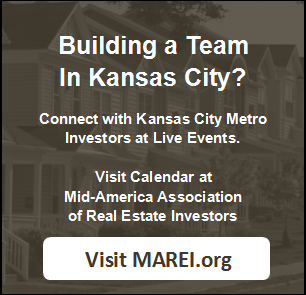 You can search for distressed properties for sale on the internet and find a bunch of wholesaler websites and you can also go to the MAREI website and see all the local properties here in KC and click through to the owners website and register as a buyer with them. Learning how to find good investment property in Kansas City isn’t hard thing… but relationships can be a key element in getting some of the best deals on properties that no one else has access to in the Kansas City Kansas & Missouri market. A few of the top investment friendly real estate brokers in Kansas City: when it comes to REO listing agents there are only a handful that actually list regularly for the banks, to find these agents, jump over to Realtor.com and look for the cheap houses in your area. Look for terms like sold as is. You might also want to check out HUDHomeStore.com and see who the listing agents are on there. Also Hubzu and Auction.com. Call those listing agents up and ask to get on their buyers list. The top handful of property wholesalers in the area. 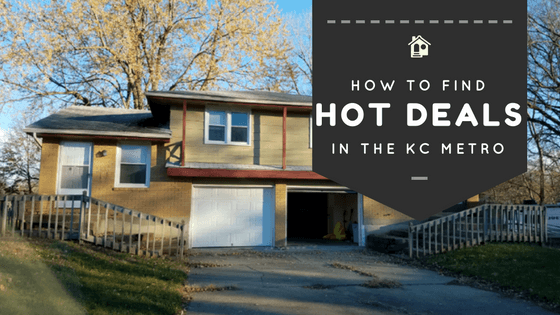 Here in Kansas City everyone tells you they are a wholesaler and just about every new investor and every seasoned veteran do wholesale when the deal comes along. But really, there are probably only 20 people that wholesale one or two houses or more ever month. Do note that the wholesaler that does a lot of properties every month is generally going to be flipping, low end, cheap houses for turn key rentals. Sure they will flip a nicer rehab property when it comes along, but those awesome rehab properties are few and far between, so you just have to be patient. The top handful of property rehabbers / flippers in the area. These guys have it figured out, they work the REO agents and the wholesalers. But most of them also have their own marketing program going on to find deals. And from time to time they are going to be too busy for that great deal or they are going to get a deal that just is not their area. So they are going to wholesale it. Service Providers in the industry, like Hard Money Lenders, Title Companies, Appraisers . . . they are going to know who just bought a hot deal and if they plan to flip it. Ask them to pass your name along. It is very tough for your REO agent or wholesaler to find YOU a deal unless YOU know what you want. Say you sign up as an investor buyer here on our site and tell us that you want a great deal, anywhere in the Kansas City metro and you might want to rehab it and sell it retail or hold it for a cash flow rental. That tells us exactly zilcho . . . nada . . . not a damn thing. From that registration we can’t really match you up to a single deal. So we are going to put you on our email list and if a deal we get goes as far as getting marketed to the masses, you might find out about it. But if you sign up as a buyer on our list and tell us you are looking for single and multi family properties that need a bit of work that you could rent out. That you buy in Lee’s Summit, Blue Springs, Grandview, and possibly Belton. We know what you want. You are were on the short list to get an email about the HOT HOT Duplex in Lee’s Summit that needed a bit of work and knew about the deal a good 24 hours in advance of our mass marketing going out. Here’s how the typical REO agent (Kim here at KCInvest, used to sell REOs) and wholesalers work. They talk to the seller and find an awesome deal. The get it inked up. Then they go to their short list of proven buyers to see who buys this type of property. They send out an email. In the case of the duplex last week, we called 4 people maybe even before we closed on it. These are the 4 people who have built a relationship with us, pay all cash, have no inspections and close within the week. If that really short list does not buy, the next is everyone who is registered for that particular area and type of investment. For the duplex that was about 27 people. Now at that point we usually stop marketing because we usually have a buyer. However with the holiday everyone was moving slow. So it went out mass marketing to everyone in our email list and on every online posting place we could find. That generated a buyer, and actually a new cash buyer that we had never worked with. Then last the property goes into the MLS (at least in our case as we are Realtors and for the REO agents because it’s a requirement), usually 3 days after it is available for sale. Our local MLS has the requirement for Realtors who list that the property must go in MLS within 3 days of listing. Some REO agents are going to use the above methods to get the property under contract with their own buyer BEFORE they put in MLS so they can get both the buyer and the seller side commissions. We also get deals that are outside of our area, or that we just don’t have time to deal with. We hit up our database to see who buys that area and we ask that investor to go with us to see the house with us for the first time. We then work with that investor to get the property under contract at a price that they like so that we can tack on a small assignment fee of a few $1000 and then they go to closing and buy it. Or if the house needs to be a listing, we will often check our Realtor list to see who works in what area and refer that listing to them for a legal referral fee. So say I get a lead in Warrensburg, or Paola where we don’t work. We may refer it to an investor to buy or to a Realtor to list and sell. Give us a call 913-735-0018 or fill out the form to get started now.